They say that when America sneezes, the world gets a cold. Well, it certainly appears as though New Zealand has caught America’s raging anti-obesity influenza. This article appeared in the NZ Herald the other day. It appears that Coca-Cola Amatil New Zealand may be adopting anti-obesity television advertisments, similar to those broacast by Coca-Cola in the US. The Otago Daily Times ran a similar article. Coca-Cola Oceania spokesman Josh Gold said the company was evaluating the US campaign’s relevance to the New Zealand market. ‘We’re going to take a look at it and see its impact and discuss it,’ he said. The advertisement released in the US themselves can be viewed here. Following the release of the ads, Coca Cola has found itself in the centre of a media storm, and has copped much criticism. For example, the Huffington Post published an article quoting food journalist Mark Bittman, who claimed the ads were “deceitful”. “It’s up to us to remember that Coke makes its money selling sugar-sweetened beverages, and even when they’re apologizing for that, as they appear to be doing here — they’re still selling them,” he told the publication. The article went on to say, “Detractors point out that it’s a bit disingenuous to brag about cleaning up a problem that they were the source of: Who started selling sugary sodas in school to begin with? Who started selling larger containers with more than one portion?” Damage control, in other words. Popular feminist publication Jezebel was also very critical of the advertisement. The writer claims that while Coca Cola is obviously trying to be caring and socially responsible by contributing to the anti-obesity dialouge but, in actual fact, by reminding consumers of all the low calorie products it produces, the company still has dollar signs in their eyes. Says the writer, “What’s weird is this: Coke is not obligated to discuss obesity…But by doing so, Coca-Cola is attempting to appear caring and responsible. When all the corporation really cares about is cash. It’s reminiscent of the low tar cigarette ads in the ’70s and ’80s. It’s like hey, this thing will kill you, but not as bad as this other thing will kill you. So keep on buying!” The Jezebel articles links to a Youtube “parody” of the advertisement, in which the changed voiceover states that even Coke’s “low calorie” products can lead to serious health problems (obesity, kidney damage and rotting teeth, among others) and that anyone wanting to lead a healthy lifestyle should not be consuming any Coke merchandise. The parody is here. Coca Cola, by the looks of things, seems pretty non-plussed. In response to some of the media flack, the corporation, in a prepared statement said, “Obesity is complex, and it requires partnership and collaboration to help solve it. We have an important role to play in the effort to find solutions that work for everybody.” As far as I can see, it hasn’t pulled the ads. And now, Coca Cola Amatil all the way down the bottom of the world in New Zealand wants to follow suit. It will be interesting to see what CCA’s advertisements will be like, and how the New Zealand public will respond to them. So far, I have not yet seen any advertisements on television addressing obesity as a public health issue. There have been many, many advertisements for programmes such as Weight Watchers, Jenny Craig and Kate Morgan, for products with nutritional value that are supposedly meant to help with weight management (such as Special K) and for programmes encouraging fitness, such as Push Play (which I’ve spoken about before). I’ve not seen any ads that encourage New Zealanders not to eat certain foods (unless they are for one of the aforementioned diet programmes) – but not in the context of curbing a nationwide health issue, in the same way that ads discouraging tobacco use, heavy drinking (such as the It’s Not The Drinking, It’s How We’re Drinking campaign) and dangerous driving are. So, I suppose time will tell how Kiwis will react to a set of advertisements flat out telling them not to consume the empty calories in Coke products, as they’ll gain weight. Especially with Coke products still on the market, and very easily accessible. As far as the US situation is concerned, I don’t know if Coca Cola has pulled any other advertisements for its products now that the anti-obesity ads are screening, or if it still running them as per normal. On TV here in New Zealand, it’s very unusual not to come across ads for Coke products, particularly for the original Coca cola. These ads feature healthy, active young people enjoying life, cuddly polar bears and even Santa Claus at Christmas. Hardly synonymous with obesity. So, it will be also interesting to see how Kiwis react to an anti-obesity message from a company that continues to broadcast feel-good advertisements (and use thin and glamourous women, as its done for some time) to sell a product. I also can’t help wondering…what next? If CCA is going to be sanctioning ads with an anti-obesity message, then how many other companies that market foods that may contribute to weight gain will be following suit? Will, for example, Cadbury and Whittakers be replacing their feel-good ads (such as this one with Nigella Lawson ) with a warning to cut down on their delicious treats? What about Mainland Cheese, with its famous “Good Things Take Time” ads? What about energy drinks? Beer? Full-cream pasta sauce? Even canned food, which may contain chemicals that contribute to weight again? If you attach warnings to one product, shouldn’t be be consistent in our approach? Or are we, by cautioning consumers away from one product while running warm and fuzzy ads for another, just assigning moral values to particular foods and beverages? 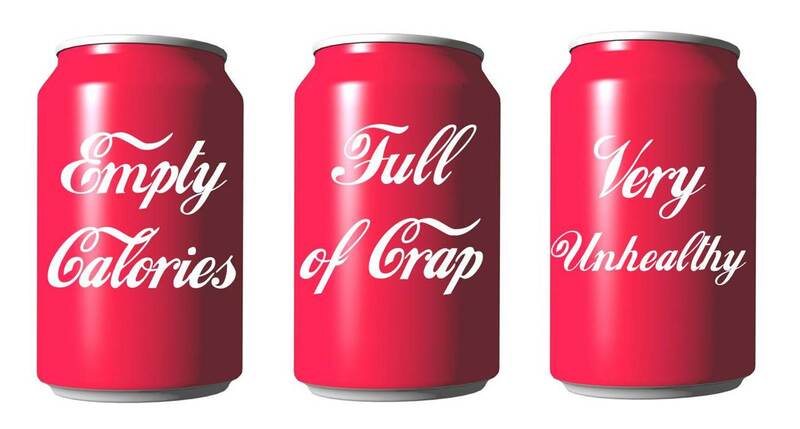 “By and large these Coke programmes promote a narrow view of what health is (to be a healthy body weight), how it may be achieved (individual healthy lifestyle choices) and at the same time ignores the wider determinants of children’s health, such as poverty, government policy, and corporate advertising. A child’s fatness is treated as a consequence of simply making the “wrong” (greedy and lazy) choices. The message from Coke is if you’re fat or unhealthy, it’s your own – or your parents’ – fault. Through discussions and debates we can question Coke’s views on obesity, challenge the assumption that ‘fat=lazy=unhealthy’, learn how others view health, and even take action to improve those wider influences on children’s health. Can’t say I disagree there. Oh, the hypocrisy of Big Soda. Glad I rarely ever have it. And this would make me switch brands.